Petaluma is one of the oldest cities in California, with one of the best preserved Historic Downtown Areas, on the National Register of Historic Places. Victorian homes and Iron Front buildings surround this charming Riverfront town. Centrally located 32 miles north of San Francisco in Sonoma County Wine Country, Petaluma is the ideal base for exploring more than 195 wineries, the redwoods, dramatic coast, Point Reyes National Seashore and the entire Bay Area. Petaluma was miraculously untouched by the 1906 earthquake. So its many exquisite Victorian homes remain, and sightseeing is a particularly rewarding treat. The Victorian riverfront charm of Petaluma’s downtown is surrounded by scenic rural back roads, offering hiking and bicycling, just minutes away. 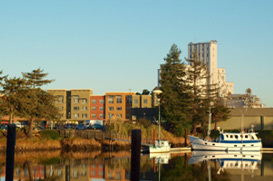 Whether it’s live theater, specialty nurseries, a variety of walking tours, bird watching or kayaking on the Petaluma River, sports, or seasonal special events, Petaluma is a great place to live.